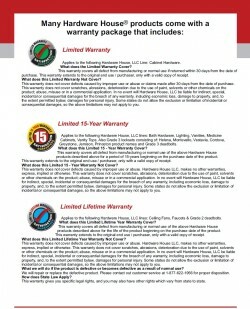 Click below to view and print our product warranty information. California’s Proposition 65, also known as the Safe Drinking Water and Toxic Enforcement Act of 1986, sets forth a regulatory scheme such that California product consumers are to be provided certain warnings for products that may expose them to chemicals known to the state of California to cause cancer and birth defects or other reproductive harm if those products can expose consumers to such chemical(s) above certain threshold levels. Proposition 65 is not a product safety law, but rather a “right-to-know” law. Businesses are entitled to provide warnings to comply with Proposition 65. We strive to provide high quality, safe products for our customers. We are dedicated to working with our customers and suppliers to meet consumer product safety requirements applicable to our products, including any applicable California Proposition 65 standards. Proposition 65 is administered by California’s Office of Environmental Health Hazard Assessment (OEHHA), a part of the California Environmental Protection Agency, and requires the State to publish and maintain a list of substances identified as carcinogens and/or reproductive toxicants to be available to the general public. The chemical list contains a wide range of naturally occurring and synthetic chemicals. For a complete list of these chemicals, visit: http://oehha.ca.gov/proposition-65/proposition-65-list.